A journeyman for most of his eight seasons in the minor leagues, left-handed pitcher Alpha “Al” Brazle overcame career-threatening arm injuries by reinventing himself as a slick side-arm sinkerball pitcher. 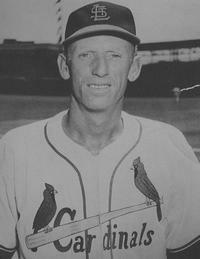 After an unexpectedly strong first half with the Sacramento Solons in the Pacific Coast League in 1943, Brazle debuted with the St. Louis Cardinals in late July and proceeded to win eight of ten decisions and post a 1.53 ERA over the last nine weeks of the season to help the Redbirds win the National League pennant. After missing more than two years to the military, Brazle returned to the Cardinals in 1946 at the age of 32 and established his reputation as a versatile, rubber-armed hurler, averaging 42 games (and 19 starts) over the next five seasons. Five years later, when he was at an age (37) when most pitchers retired, he transformed himself into a modern, prototypical relief pitcher by compiling the most saves in a season (by modern standards; saves were not a statistic in those days) twice, setting a Cardinals team record for appearances by a pitcher, and averaging 55 games per season. Alpha Eugene Brazle was born on October 19, 1913, in Kiel, Oklahoma, the third and youngest child born to Willis Elmer and Mary Frances (Wight) Brazle. The Brazles were farmers in Kiel, located about 70 miles northwest of Oklahoma City. The town had a large German and Russian immigrant community and changed its name to Loyal during World War I. Not long after Alpha’s birth, the family moved to a different farm, about 80 miles south, in Lone Mound Township. Willis died in 1923, and Frances, known as Fannie, raised William, Flossie, and Alpha. Alpha attended Sickles school, but quit by the age of 15 to work and support the family in harsh economic times. At around the same time, the tall and lanky Brazle began playing for a local town team and gradually progressed to a semipro team in nearby Binger, Oklahoma. Brazle’s first three seasons (1936-1938) in professional baseball were undistinguished. A 7-8 record and 5.92 earned-run average for the Class A1 Travelers, a Boston Red Sox affiliate, in 1936 was followed by a demotion to the Hazleton (Pennsylvania) Red Sox in the Class A New York-Pennsylvania League in 1937. He fared better (10-14 and 4.02 ERA), was brought back to Little Rock in 1938, season, and posted another 7-8 record. Then, unexpectedly Brazle developed into the staff ace in 1940 and ranked in the league’s top ten in wins (14), innings (217), starts (28) and ERA (3.40). On the recommendation of scout Billy Evans, the Red Sox purchased his contract after the season and invited him to spring training in 1940. Brazle reported to Red Sox camp in Sarasota, Florida, where he roomed with 21-year-old Ted Williams. Determined to show manager Joe Cronin that his overhand fastball and curve were major-league ready, Brazle developed arm problems, for the first time in his life, and was reassigned to Little Rock. In pain all season (and by one report suffering from food poisoning, too), Brazle limped to a 6-10 record and a 4.70 ERA. At the end of the season, the Red Sox traded him to the St. Louis Cardinals for 37-year-old pitcher Mike Ryba. Brazle’s prospects with the Cardinals looked dim. The organization’s strength was pitching, both at the major- and minor-league levels. Brazle had difficulty lifting his left arm above his head and he was forced to change his delivery. “Perhaps the best break of my career was to develop a sore arm. I used to pitch entirely overhanded and I liked to cut loose. I had pretty good speed,” he said in 1943. “The injury forced me to pitch side-arm and I developed my sinker.”iii Brazle experimented with a side-arm delivery with the Houston Buffaloes of the Texas League in 1941 and 1942 with mixed results (11-5, 3.35 ERA and 8-13, 3.45 ERA, respectively) while building his arm strength. Considered washed up, Brazle was an afterthought on Houston teams that included Fred Martin, Howie Pollet, and Ted Wilks. When the Texas League folded before the 1943 season, Brazle was reassigned to the Sacramento Solons in the Pacific Coast League. “Ken Penner, the Sac’s manager, didn’t know that I was supposed to be an overhand pitcher,” said Brazle.iv Free to pitch as he wanted, Brazle responded with his best year in Organized Baseball. He tossed a league-record 42? consecutive scoreless innings on his way to an 11-9 record and league-best 1.69 ERA. When Pollet, then the Cardinals’ 22-year-old phenom, was inducted into the military in midsummer 1943, Brazle was tapped as his replacement. With the World Series tied at one game apiece, Brazle started Game Three against the Yankees in New York. He breezed through the first five innings, surrendering just two hits. He was undone by poor fielding in the sixth and seventh innings, giving up six runs (three earned), and was charged with the 6-2 loss in a sloppy game. Still, the Yankees were impressed with Brazle’s unique delivery. “We haven’t seen anything like that stuff since (submariner Elden) Auker,” said an unnamed Yankee. “[Brazle’s] very tricky.”vi Behind the pitching of Spud Chandler, the Yankees won the Series in five games. In just a half-season with the Redbirds, Brazle became a fan favorite. He seemed to have come from another era. He was tall (6-feet-2) and bony, and had a gaunt, thin, leathery face, with sunken cheeks and deep-blue eyes. With his long neck, he was said to resemble Ichabod Crane, the character from Washington Irving’s The Legend of Sleepy Hollow. Brazle’s shock of white-blond, wiry hair earned him the nickname Cotton, originally given to him by an uncle, but one that fit his appearance. Though he weighed about 185 pounds, he seemed thinner, perhaps because of his square shoulders, which made his jersey appear to hang from his body. He wore his uniform pants skin tight and his cap perched on the side of his head, reminiscent of the style from the 1920s and early 1930s. The Cardinals’ clubhouse was full of country boys, but Brazle came across as a Western cowboy. His loose, deliberate gait was accentuated by his cowboy boots. Longtime Cardinals sportswriter Bob Broeg recalled how Brazle drove around St. Louis in a big, cream-colored Lincoln Continental, looking like a fish out of water, but with friends everywhere, prompting Cubs manager Charlie Grimm to call him Clark Gable, “partly in derision, partly in admiration.”vii Brazle married Helen Blankenship, a Little Rock native, on July 31, 1939. In the offseasons, they divided their time between Little Rock and Montezuma County, Colorado. He held down various jobs, including selling cars. Brazle rejoined the Cardinals in May 1946 directly after getting his discharge. The Redbirds staff, which had lost no fewer than ten pitchers to the service, was at full strength again. Described by The Sporting News as “the greatest bunch of hurlers ever assembled on one club,” the Cardinals boasted ten potential starters, Johnnie Beazley, Harry Brecheen, Ken Burkhart, Murry Dickson, Howie Krist, Max Lanier, Red Munger, Howie Pollet, Fred Schmidt, and Brazle.ix As the oldest of the group, Cotton was eased back into action by manager Eddie Dyer, who knew Brazle as a broken-down lefty during their one year together in Houston (1941). After three relief appearances, Brazle started and pitched four-hit ball for six innings in a no-decision against the Giants on June 3, his first start in two years and eight months. “Showing only flashes of [his] former self,” Brazle’s record fell to 2-7 on July 13.x As the Cardinals waged a tight race with their archrivals, the Brooklyn Dodgers, for most of the season, Brazle gradually regained his form. He tossed a four-hitter against Boston at Braves Field on July 28. Two starts later, he hurled the best game in his big-league career, a three-hitter against the Cubs at Wrigley Field on August 12. Dividing his time between starts and relief outings, Brazle made 11 appearances in September (the second most behind Wilks), but struggled in his last four relief outings (seven earned runs in six innings) as the Cardinals lost three of their last four games to end the season tied with the Dodgers. He finished with an 11-10 record and a 3.29 ERA. After not pitching in the Redbirds’ two-game sweep of Brooklyn in the major leagues’ first-ever tie-breaker series, Brazle saw action in Game Five of the World Series against Boston. He relieved Pollet, who had managed just one out in the first inning, and pitched 6? unspectacular frames, yielding seven hits and issuing six walks. He was charged with the loss, a 6-3 defeat that put the Cardinals behind, three games to two. Behind the pitching heroics of Brecheen, the Cardinals won Games Six and Seven to secure their third championship in five seasons. Brazle never made it back to the World Series and finished with a disappointing 0-2 record and 4.50 ERA in 14 innings in the fall classic. Preseason favorites to win the pennant, the Cardinals floundered in 1947. The year also marked a shift in power from the Cardinals to the Dodgers who dominated the National League over the next 20 years (1947-1966). It was also the season Jackie Robinson arrived in Brooklyn. The season started off poorly for the Cardinals (2-11 on May 4) and was worsened by rumors that Cardinal players were actively attempting to foment a strike against baseball integration. The entire season was marred by clubhouse tension. Brazle was no longer a front-line starter at the age of 33, but proved to be the team’s most effective pitcher. “Al’s rubber-armed,” said Eddie Dyer. “He’ll get plenty of service … as a starter and in relief.”xi Brazle threw a fastball-sinker side-arm to left-handed batters and preferred a curveball at a three-quarter delivery to right-handers. According to The Sporting News, the sinker “tails off, drops sharply … and is effective at medium speed.”xii Brazle dipped his left shoulder and had a slight buckle to his knees when he threw; consequently, some described his delivery as “herky-jerky” and “deceptive,” and he appeared faster than he was.xiii After making 12 starts before the All-Star Game and completing five of them (including a career-best 12 innings in a complete-game, 1-0 loss to the Phillies), Brazle settled into the role of spot starter and fireman, leading the team with 27 appearances (just five starts) in the second half. Bob Broeg began calling him Ol’ Boots and Saddles, a suitable nickname in reference to an army bugle call. Brazle seemed to be always ready to pitch and needed just a few tosses to warm up. He finished with a career-high 14 wins and notched a 2.84 ERA in 168 innings for the second-place Cardinals. A new era began for the Cardinals in the offseason when owner Sam Breadon sold the team to a group led by Fred Saigh and minority investor Robert Hannegan. They retained Dyer as manger and braced for a return to first place. With the rise of Ted Wilks as the team’s primary reliever, coupled with the ongoing absence of Max Lanier (who had been suspended in 1946 for five years because of his jump to the Mexican League), Brazle started 23 times and relieved in 19 games. After a rough start to the season, he regained form, tossing two shutouts in a four-start span in June. The tension of his five-hitter against the Phillies in a 2-0 victory on June 6 was exceeded by a classic pitching duel with Warren Spahn on June 21. Brazle held the league-leading Braves to seven hits and won, 1-0. But unexpectedly the Redbird pitching staff struggled in 1948. Dickson, Munger, and Pollet posted earned-run averages over 4.00. Though Musial won his third Most Valuable Player Award in five seasons, the rest of the offense failed to produce. The surprising Braves, led by Spahn and Johnny Sain, won the pennant by 6½ games over the Redbirds. Brazle won his last three starts of the year to finish at 10-6 with a 3.80 ERA. Brazle began the 1949 season with two consecutive complete-game victories on his way to setting career highs in starts (25) innings (206? ), and complete games (9), and tying his career high in wins (14). With lefties Pollet (20-9, 2.70 ERA), Brecheen (14-11, 3.35), the returned Lanier (5-4, 3.82), and Brazle, The Sporting News opined that the Cardinals “may have assembled the best southpaw staff in history.”xiv The pitchers rebounded to lead the NL in ERA, but, poor pitching in the last ten days of the season doomed the team. They lost six of eight games (surrendering 46 runs in six losses) before winning the final game of the season, but the Dodgers also won and took the pennant by one game. It was the last time the Cardinals seriously contended for the pennant until 1963. The Cardinals fell to fifth place in 1950, their worst finish since 1938. The team had grown old and the farm system had failed to produce as it had under Branch Rickey. The pitching staff averaged 31.0 years of age, the oldest in the major leagues. Brazle, who at 36 looked years older with his weather-beaten face, struggled in his role as a combination starter and reliever, posting a 4.78 ERA after 30 appearances (12 as a starter and 18 as a reliever) through mid-August. When Ted Wilks proved ineffective after his return from arm miseries, manager Dyer used Brazle exclusively as a reliever in the last five weeks of the season. Ol’ Boots and Saddles responded by pitching in 16 of the team’s next 36 games, logging 40? innings, and posting an impressive 2.01 ERA. Brazle’s new career as the team’s primary reliever was born. Over the course of the next four years (1951-1954), Brazle developed into a prototypical reliever. He appeared in 220 games (all but 14 as a reliever), set a team record with 60 appearances in 1953 as a 39-year-old, led the league in saves (still an unofficial statistic at the time) in 1952 and 1953, and marked the transition in the use of relief pitchers throughout baseball. No longer in possession of speed, Brazle got by with the peculiar delivery of his sinking fastball and curve. He was quick to warm up, and his pitches were ideally suited for one time through the batting order. “I’ll be better off,” Brazle said of starting or relieving in 1951, “if I do one or the other, but I can’t start and relieve, too. I’m satisfied to try to help exclusively as a fireman.”xv New manager Marty Marion was happy to oblige. Brazle made 44 consecutive appearances in relief to start the season before being asked to enter the starting rotation because of injuries and general ineffectiveness of the starters. He responded by tossing a complete game five-hitter to defeat the Reds in his first start. He completed five of eight starts and posted a 2.83 ERA. Lauded as the lone bright spot of a disappointing staff, Brazle made 56 appearances, logged 154? innings (the sixth consecutive – and last – time he pitched more than 150 innings in a season) and posted a team-best 3.09 ERA. Brazle inaugurated the 1952 season by pitching 15? scoreless innings for new player-manager Eddie Stanky. For the retooled Cardinals staff, with youngsters including Vinegar Bend Mizell (21), Joe Presko (23), Cloyd Boyer (24), and Stu Miller (24), Brazle was almost like a grandfatherly figure and he enjoyed cultivating such an image. “I go down to the ballpark at the start of the game,” Brazle said, “and doze until the sixth and then get ready if we have a chance to win. But if we’re losing, I just go back to sleep.”xvi Brazle (40 appearances in relief) and 27-year-old rookie Eddie Yuhas (52 relief appearances) formed the NL’s best righty-lefty relief duo. Brazle also completed three of six starts, including his last big-league shutout, a five-hitter against the Pirates. Alfie, as his teammates called him, had the “greatest season of his career,”xvii and finished with 12 wins, a 2.72 ERA in 109? innings, and 16 saves. Used exclusively in relief by the Cardinals in 1953, Brazle was the last remaining hurler from the 1943 pennant-winning club. He set a team record with 60 appearances and 18 saves (the most in the league), though his ERA rose to 4.21 (just above league average). Hal White (2.98 ERA in 49 appearances) replaced the injured Yuhas as Brazle’s right-handed partner for the third-place Cardinals. In the Cardinals’ youth and rebuilding movement in the offseason, Brazle was unexpectedly released on October 19. In light of his 118 appearances over the last two seasons (second only to Hoyt Wilhelm’s 125 in the NL), Brazle was not ready to retire. He pitched for Havana in the Cuban Winter League, hoping to interest scouts. Former Cardinals manager Marty Marion, who took over as skipper of the White Sox at the end of the 1954 season, was in Cuba on a scouting tour. Impressed with Brazle’s stamina, he invited the 41-year-old to spring training. Brazle went, but was cut. He caught on with Sacramento of the Pacific Coast League, but a 6.31 ERA in 19 relief appearances signaled that it was time to hang up his spikes. In his ten-year big-league career, Alpha Brazle won 97 games, lost 64, and posted an impressive 3.31 ERA. His adjusted ERA, a metric that compares a pitcher’s ERA to the league’s ERA and adjusts it for ballpark factors, ranks him equal to Rollie Fingers and just above contemporaries Bob Lemon and Warren Spahn. In nine mostly pedestrian years in the minor leagues, Brazle won 75 and lost 83. Brazle retired to the St. Petersburg, Florida, area with his second wife, Mary Brophy whom he married in November 1954. He became a father and had two sons. As he was during his playing career, Brazle seemed to be everyone’s friend. He managed an apartment complex and was later a building contractor. He was the head baseball coach for the 1965 season at Florida Presbyterian College (later renamed Eckerd College), succeeding former big leaguer Bob Porterfield. Brazle divorced in 1967 and relocated to Cortez, Colorado, where he had relatives. On October 24, 1973, Alpha Eugene Brazle died at the Veterans Hospital in Grand Junction, Colorado. The cause of death was a heart attack. He is buried in Fairview Cemetery in Yellow Jacket, Colorado. i The Sporting News, December 16, 1943, 7.
iv The Sporting News, September 17, 1943, 5.
v The Sporting News, December 16, 1943, 7.
vi The Sporting News, October 14, 1943, 12.
vii Bob Broeg, “No-Dazzle Brazle Had Wining Habit,” St. Louis Post-Dispatch, October 31, 1973, 5B. ix The Sporting News, April 18, 1946, 5.
x The Sporting News, July 10, 1946, 16.
xi The Sporting News, September 17, 1947, 5.
xiii Harry Grayson, “When Cards Short-Handed Up Pops Another Star,” Zanesville (Ohio) Signal, September 15, 1943, 9.
xiv The Sporting News, July 6, 1949, 9.
xv The Sporting News, January 31, 1951, 18.
xvi The Sporting News, May 28, 1952, 19.
xvii The Sporting News, July 16, 1952, 10.
xviii The Sporting News, October 27, 1954, 9.